Fluorescent endoplasmic reticulum and plasma membrane stain. Exhibits rapid uptake in live cells. Displays low cytotoxicity and is resistant to photobleaching. Suitable for imaging live and fixed cells in short and long time course experiments. Compatible with fluorescent microscopy using single photon excitation at 403 nm or two-photon excitation between 800 and 830 nm. Excitation/emission λ: 350-405 nm / 500-650 nm. Left: PNT2 prostate epithelial cells stained with ReZolve-ER™. 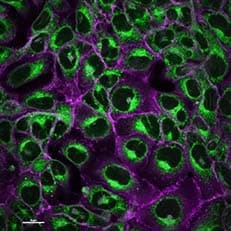 Right: PNT2 prostate epithelial cells stained with ReZolve-ER™ (green) and CellMask (purple)*. Cells are incubated with growth media containing 20 μM ReZolve-ER™ for 10-20 min before imaging. 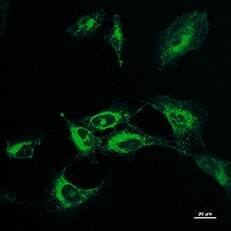 Cells were viewed using a Nikon+A1 confocal microscope, ReZolve-ER™ is excited at 403 nm and emission is collected using a 525 nm GaaS PMT detect. The following data is based on the product molecular weight 596.58. 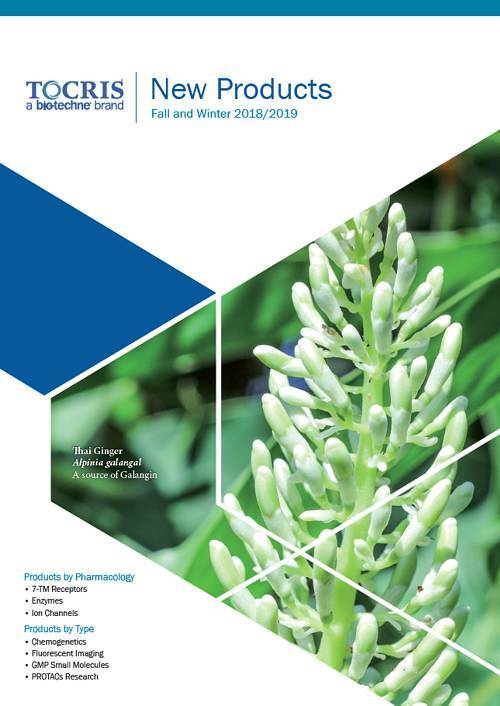 Batch specific molecular weights may vary from batch to batch due to the degree of hydration, which will affect the solvent volumes required to prepare stock solutions. If you know of a relevant reference for ReZolve-ER™, please let us know. Currently there are no citations for ReZolve-ER™. Do you know of a great paper that uses ReZolve-ER™ from Tocris? Please let us know. There are currently no reviews for this product. Be the first to review ReZolve-ER™ and earn rewards! The following protocol features additional information for the use of ReZolve-ER™ (Cat. No. 6640).